Architect Damien Brambilla turned a run-down Paris apartment building into an open, bright adolescent group home with a landscaped garden. The site was an overgrown apartment building when Brambilla arrived. A common space features Hee Welling’s About a Chair 12 for Hay and a Stick round table by Valsecchi 1918. The bedrooms are furnished with Overtime desks by Stina Sandwall for Abstracta, Jim beds by File Dans Ta Chambre, and DLM tables by Thomas Bentzen for Hay. The About a Chair 22 seats by Hee Welling are covered with cushions upholstered in fabric from Kvadrat—a different shade for each room. Brambilla designed and crafted the built-in bookcase in a common area from laminated red birch. The exterior required significant refurbishment. He spruced up and modernized the facade without sacrificing any of its period charm. Brambilla used part of the $2.9 million budget to acquire pieces from Hay, including Hee barstools by Hee Welling that are lined up by a long bar in a common area. A lounge is furnished with a Mags Soft sofa, an Ella coffee table, and a pair of Ray Lounge Chairs by Foersom Hiort-Lorenzen, all from Hay, and a Wow ottoman and tabletop by Pedrali. 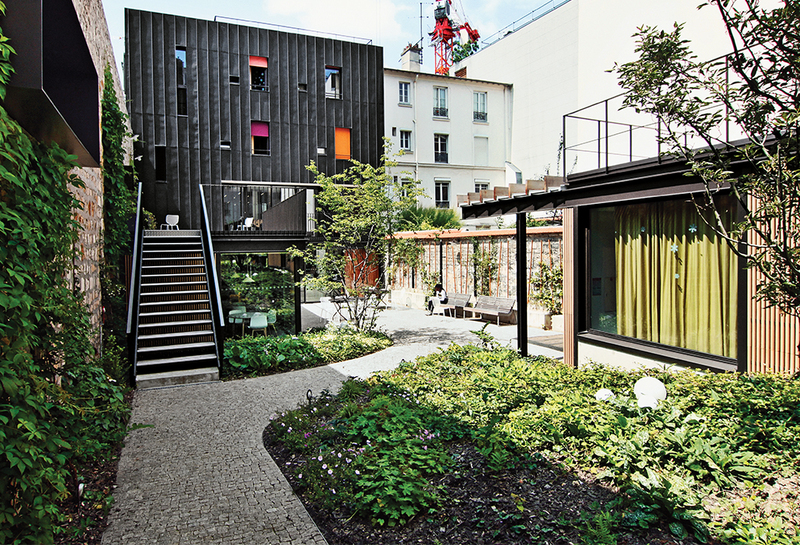 He took a derelict apartment building with an overgrown garden in the Belleville section of northeastern Paris, gutted it to the foundation, and added an extension that doubled the original square footage. On the street side, he restored the typically Parisian facade, but indoors it’s a different world, all glass, lacquered metal, and sleek wood. Brambilla’s reference point was not French—much less Parisian—but rather Californian: the revolutionary midcentury Case Study Houses, which emphasized structural lightness and a breezy continuity between indoors and out. The project, completed early last year, was not without its challenges. The narrow lot, accessible via a tiny, sloping street, offers little room to bring in heavy materials. “We needed to use easily transportable equipment and a minimum of concrete, reserving it for the foundations and the construction of the flooring,” Brambilla says. But he enjoyed luxuries not usually available for such projects, including a generous budget (2.6 million euros, or $2.9 million), furnished by the French government, that allowed him to acquire quality furniture, including Hay chairs and Abstracta desks. At 250 square feet, the shared bedrooms are smart and airy, despite their small size. But Brambilla tried to create spaces that would encourage common living: from a long kitchen bar, where residents can eat and socialize, to a covered terrace and a peaceful garden, filled with shade-loving varietals that bloom year-round. That “jardin romantique,” designed by the Paris-based landscape architecture firm Atelier Roberta, is both the “heart and the lungs” of the house, Brambilla says.